I feel fine and I don’t have any symptoms like chest pain. Studies have shown that 50% of people who get a heart attack had no prior symptoms and 65% do not survive their first encounter with a heart attack! My doctor said I don’t need the test because he/she can tell my risk level. Wrong! Your doctor only has a very general idea of your risk by using conventional risk factor assessment. Studies have proven that decisions about lifelong cholesterol lowering therapy will be wrong about 40% of the time without a heartscan. Would your doctor discourage a middle aged female from getting a mammogram? Another way to think about this: Imagine if you hurt your arm and thought it might be broken. You go to your doctor to find out. Your doctor tells you he is going to do a blood test on you and to come back in a week and he will tell you if your arm is broken or not. What would you think?? Exactly. Using “conventional risk factors” to determine heart disease risk was great when they were all that we had. These risk factors were okay as “Guess-timates”. They are very far from perfect as evidenced by the fact that statistically, the number of heart attack deaths has not changed since 1900 in the American population. In other words, we have the same percentage of Americans dying of heart attacks today, in 2014 as we did in 1900. 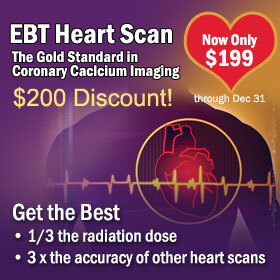 We now have the EBT technology to find out who has heart disease by looking at their heart. One doesn’t need a medical degree to see that this makes more sense than looking at blood particles. The way to see who has heart disease is to look at their heart. 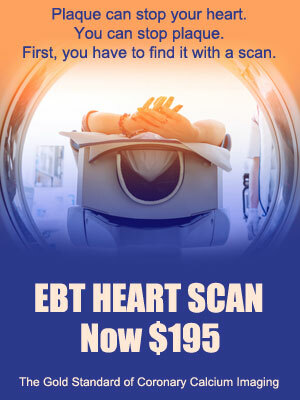 The best way to look at your heart is with an EBT Heart Scan. It is really just that simple. My insurance company will not pay for the test. At this point in time, no insurance companies cover the cost of a heart scan. There was also a time when insurance companies didn’t cover mammograms, bone density scans, or prostate screenings either. Many insurance companies are not enthused about preventive measures aimed at lowering risks for heart attacks that may occur 10 years from now. Hopefully this will change as it did with other preventive screening procedures. Sometimes, making a personal investment in your own health is necessary, just as we pay for regular car maintenance to prevent future problems. I heard the heart scan does not detect whether I have major blockage. Correct. Heart scans are about finding plaque long before any blockages occur. Contrary to what many of us believe, the majority of heart attacks occur because unstable plaque ruptures, not because there is a blockage. Two thirds of heart attacks occur when there is no significant blockage.. no stress test can find that out! My doctor said “no one knows what to do with results” or “they only measure calcified plaque” or the “test is not accurate or specific”, etc, etc. Unfortunately, this is a very uninformed physician. Send us the physician’s name. We will send them a complimentary set of the CDs “Heart Matters – Beyond Cholesterol” and “Heart Scans.” If that doesn’t work, we suggest you change your physician. Should I Get a Heart Scan?